Warm milk in a small pot. 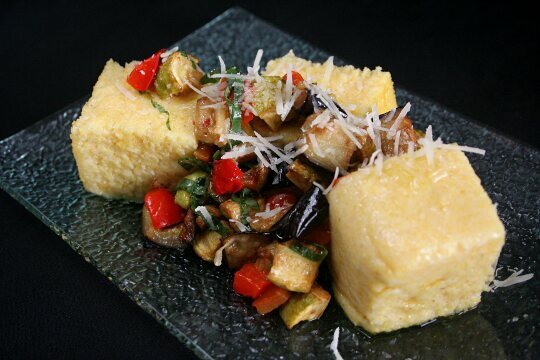 When milk starts to boil, gradually add polenta, constantly stirring. Add salt and cook for approximately 20 min. While cooking you'll need to add boiling water, to keep it from burning. When it is ready, stir in grated parmesan and butter. Transfer into oiled cooking form and let it set. Roast bell peppers, put them in a tight seal container (or a plastic bag) for a few minuted, peel and dice them. Transfer them into a bowl. Dice zucchini and eggplant and fry them until golden. Soak the excess oil and add them into the bowl with roasted peppers. Add minced garlic, basil, salt and chili flakes to the bowl and mix everything. 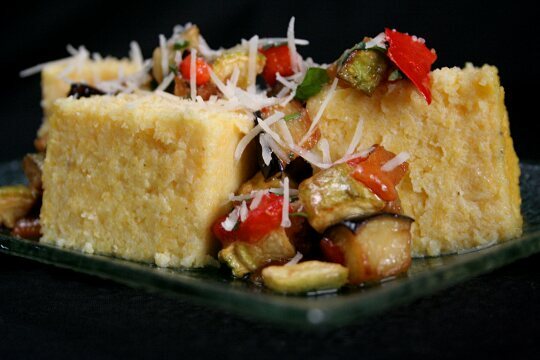 When cooled, cut polenta into cubes or fingers. You can roast them, deep fry or simply serve as they are with warm salad on top and some grated parmesan.